High Fructose Corn Syrup (HFCS) is a sweetener made with made from corn starch. It is generally used as a sweetener for candy and soda. HFCS has also been used as a replacement for honey in bee colonies where nectar is in low supply. To produce HFCS, corn is milled to produce corn starch, which is then acidified and exposed to multiple enzymes to produce HFCS. HFCS is very important in the soda industry, as nearly all sodas contain it. It is used as a replacement for sugar in most “diet” sodas. HFCS is used in candy, yogurt, juice, bread, frozen dinners, and bread as a cheaper alternative for sugar. The nutritional value of HFCS has said to have been identical to cane sugar. The corn producers say your body handles it the same exact way it handles cane sugar. However, HFCS contains substantially more fructose than cane sugar. Fructose builds up in your liver, causing fatty liver syndrome. HFCS also punches holes in your digestive lining. The way HFCS is handled is also not very safe. 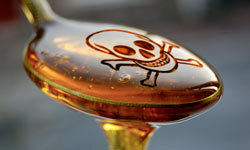 The production of HFCS is not monitored by the FDA, and mercury contaminates the syrup. Some people dislike the taste of HFCS, preferring foods sweetened with cane sugar. As such, HFCS marks food with it as low quality, processed, and industrialized. The corn industry has tried to keep these nutritional facts a secret, calling HFCS “corn sugar”. But if you truly care about your body, stop eating products with HFCS.